Bug's Temple is a beautiful metaroom by Bug. It has 4 levels, the bottom one being filled with water. Although this room doesn't have any agents in it (with the exception of the Teleporting Stone and a couple of lamps), it is, according to most users, well worth the download. Its levels are extremely fertile - the Temple is the perfect place to mix and match plants from other metarooms. Seven statues adorn this room - the seventh and largest statue a tall woman, holding up the levels with her multiple sets of arms. The room has a peculiar theme - Life and Death, and how they are inextricably linked. Bug's Temple also comes with a strange new breed - the Draconian Norns. You can download this room at Treesprite's Creatures Grove. 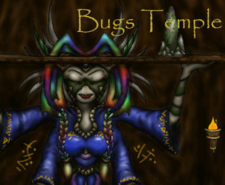 In 2006, TreeSprite and Bug made an addon for Bug's Temple (Temple Cos Files) which adds some C3 norn terrarium wildlife to Bug's Temple, to assist GEO-runners care for their creatures. Malkin incorporated some of Vampess's Minor Fixes into some agents that needed it. The cos files were turned into an agent, Bug's Garden, by LordPsycho in June 2010, and the agent is available on Creaturetopia. Bug's Temple overlaps with the Bubble Colony. This page was last modified on 11 November 2017, at 03:20.